Let me start off by saying I absolutely love the flavor of the black cards in Origins. I was a big fan of Innistrad block and to see familiar cards back and characters I know makes me all . . . well not warm and fuzzy, but you get the picture. 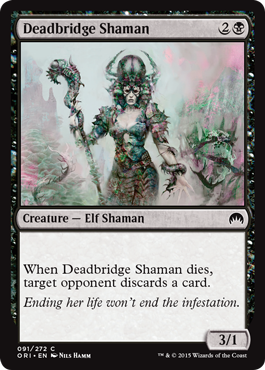 Outside of all the macabre, ghouly cards from that block, I also like that we’re getting some more “dark” elves. It lets us play with the color pie a little more, and brings something a little bit different to black in the limited Origins limited format. I also like a lot of the rares and I’m excited to see how they’ll influence standard, but that will be saved for another time. Today I’ll be working on the best uncommon and common cards in Magic Origins Limited. We all know that the most important cards in limited are removal spells, and players always look to black for the best. At common you can’t expect much, but Unholy Hunger is a good late game draw that nets you 2 life most of the time that just might turn the tide in battle. It’s no Ultimate Price or Murderous Cut, but it will get rid of your opponents threats all the same. The only thing holding it back is the 5 mana casting cost. I think it’s worth picking rather early in draft and it will be good in sealed. Reave Soul is a great card to have early on in the game when your opponent is playing their 2 and 3 drops. I expect many people to be filling up their curve with a lot of 2 and 3 power creatures, which makes Reave Soul all the more effective. It also has good synergy with cards like Nivix Barrier and Eyeblight Massacre (the new Drown in Sorrow of sorts). You wouldn’t be wrong to pick this early in draft, and it would be really good against white decks prior to those creatures becoming renowned. I think it works best in UB decks, but don’t let that stop you from using it in ANY black deck. If only it had been instant! If you ever get overwhelmed with Thopter tokens, massacre them. Making a GB Elf deck in draft is definitely possible and would be Eyeblight Massacre’s optimal deck, but I think there are enough playable elves in black to make it playable in sealed as well. You have to be careful when building your deck to make sure you don’t hamper yourself, but I think the benefits of this card outweigh the risks. If you get 4-5 playable elves play it in your main board. 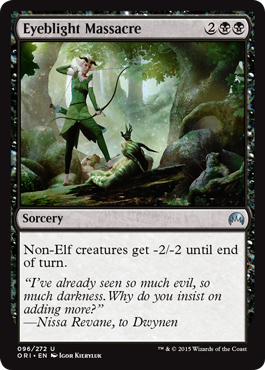 As I said above, GB would be the best colors for this card since it gives you access to all the elves. I’d rather have spot removal if I possible, but I’m also willing to make some sacrifices to gain the upper hand. This card seems like A LOT of fun to play with. Yeah it doesn’t do much at first, but later in the game I wouldn’t mind paying 5 mana to drain two life from my opponent. It’s a good mana sink and being able to scry 1 (think of it as a Reaper of of the Wilds ability) whenever a creature dies is good. It works well with cards that have a built in sacrifice effect like Nantuko Husk, and if you have a token maker like Thopter Spy Network in a UB artifact deck, you’ll have no shortage of creatures to sac and block with to gain incremental advantage. This is a grindy card, but a good one that can help you turn the tide late in the game. I wouldn’t be afraid to cut it in my limited deck, but it would also be fun to try out in slower decks that have good defense and a good long game. The best limited combo I heard of including Fleshbag Marauder was to play him with a Liliana in play, sacrifice and get a token to flip her, then when she flips use her -3 to bring him back and do it again. Your opponent loses 2 creatures and you end up with a 3/1 creature. Sure you don’t want to do that while you’re ahead, but if 2 creatures is all that stands between you and an alpha strike to win the game, I think it’s worth it. Outside of that combo, there are plenty of ways to return a creature to the battlefield (Cruel Revival, Macabre Waltz, Necromantic Summons), so you can get good value out of the Marauder if you’re struggling for good removal. He’s got a relevant ability and his 3 toughness trades with a lot of creatures. Might not make him my first choice in draft, but I would pick him up the second time around if it’s still in the pool. The 5 mana casting cost might be a little high, but this is still a good card. In some situations, its even a great card. At it’s worse it’s a 5 mana instant kill spell that destroys anything non-zombie. 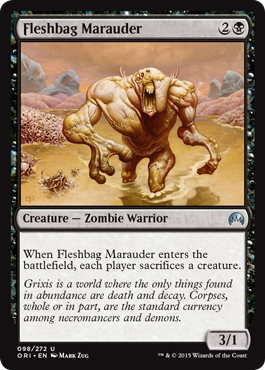 At it’s best you kill a creature AND get a zombie back like Fleshbag Marauder. This card would be pretty good in draft if you could get your hands on a few Undead Servants and Nantuko Husks to bring back from the graveyard. It’s really too bad that Possessed Skaab has to be exiled when it dies cause this would be an infinitely re-usable removal spell in limited. Good pick in draft and something you want to take the first time you see it. This card wouldn’t make it around the table again. 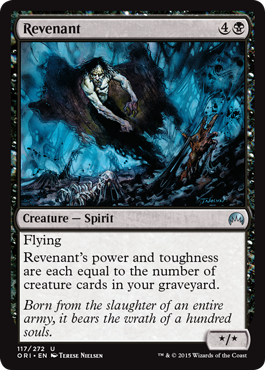 Revenant is probably one of the better black creatures at common/uncommon. It’s a X/X flyer that gets bigger as the game goes along. He could easily become a finisher, and has great synergy with cards like Nantuko Husk and Fleshbag Marauder. His only draw back is that you’ll have to wait to play him until there are enough creatures in your graveyard to make him worth it. I think he’s worth playing once you get 3 creatures in there. You shouldn’t have a problem getting him to 5/5 or 6/6 in a format that’s full of creatures. I’d pick him highly in draft. Here’s one of those elves I mentioned earlier. 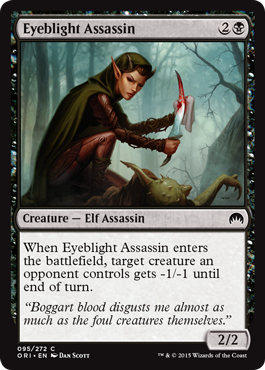 Eyeblight Assassin assures that a creature that just barely survived combat will die, or that your big beater won’t get chump blocked by that pesky 1 toughness creature. It gets rid of cards like Kytheon without having to worry about his indestructibility and has an overall favorable match up against white creatures. Your opponent will always have to worry about it when blocking if you haven’t played it yet, and it will give you a slight advantage if played before attacking to make your opponent block unfavorably. Not a high draft pick, but something that will be common in black decks. It’s too bad this isn’t “any creature” but then again it’s uncommon. This card can shine if you’re playing an aggressive deck that forces your opponent to block early, or if you have a decent amount of removal at hand. I really like him played on turn 2 then followed up with a Fleshbag Marauder on turn 3. If you can get his toughness over 3 and then use an Eyeblight Massacre against another aggressive deck, he would be almost unstoppable the next turn. Pretty good 2 drop for BW or BR decks. I’d pick it up somewhat early in draft, but not as one of my first few choices. Three mana for 3 power and the ability to force your opponent to discard a card is good for a common. If they are holding onto their finisher and are unable to cast it, they’ll have to let the damage come through. You can also use it strategically alongside a card like Nantuko Husk to force the other player to discard when it’s most favorable to you. Roleplayer, good 3 drop. Pick these up early in draft if you’re playing black, especially in packs 2 and 3. Played early, they can destroy an opponent’s hand and give you the upperhand quickly. 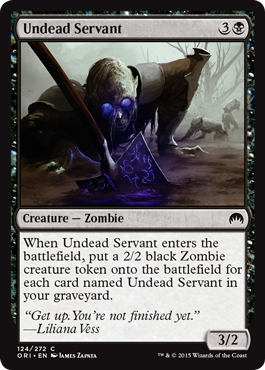 Undead Servant, very much like Faerie Miscreant, is one of those cards that is much better in draft that in sealed. In sealed it would be one of the cards you’d play as your 21st, 22nd, or 23rd choices, but in draft it would be much better as long as you could get your hands on a 1-2 others. 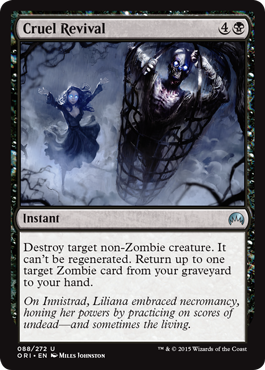 The 3/2 body for black is decent, but it becomes better if you can throw in a second 2/2 zombie for the same cost. If black is open in your draft pod, try to get as many as you can. I’d consider him 3.5 stars in draft, but in sealed I’d have to go a little lower and give him an average score. This card reminds me a little of Blood-Toll Harpy from Theros. The big difference is that we pay an extra 2 mana for more toughness, power, and an extra point of loss life to both players. The upgraded stats are definitely welcome, and it gives black more power in the air which is always welcomed. The minus 2 life won’t stop me from choosing this as my 5th-6th pick in draft, nor will the 5 mana casting cost. Black can always use more flyers in limited. I think it matches up best with BW and BR aggressive decks. 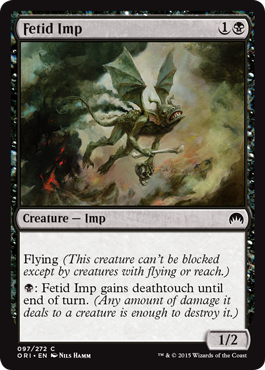 I like Fetid Imp if only to stop pesky 1/1 Thopter tokens and to trade with your opponent’s biggest creature or keep them at bay while you build up your board. This is something I’d pick up in the middle of my first booster pack in draft, or a little bit earlier in the next two. Make sure to always keep that black mana open for it! 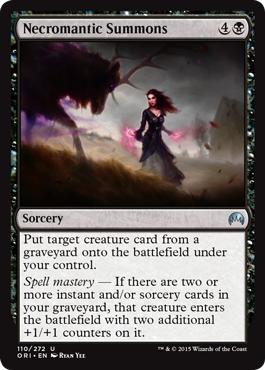 What makes this card appealing to me is the “put a creature from A graveyard in play”. 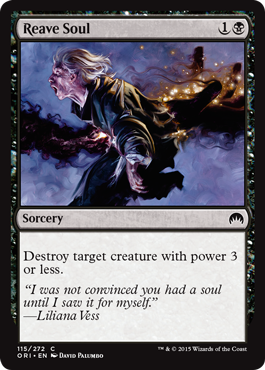 Causing your opponent to discard their finisher then bringing it back into play on your side can be soul crushing. Adding counters with spell mastery just adds insult to injury. This can really turn the tides of the battle late game if you just killed a big creature with removal then bring it back next turn. I’d take this pretty highly in draft if you’re playing black because it lets you make their resources yours. I’d also like to point out that this type of effect can also bring back dead planeswalkers in their creature forms. Getting two or more uses out of a planeswalker just isn’t fair (for your opponent). Dark Dabbling is a good card if you’re building an aggressive black deck such as BR or BW where you’ll be attacking often. It’s basically a combat trick that cantrips which isn’t so bad. 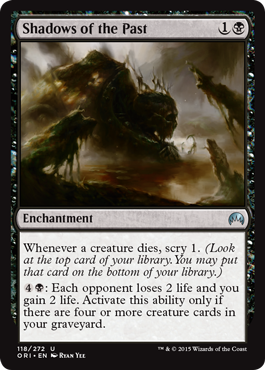 I’ve played with Necrobite (AVR) in limited before and while this doesn’t let you kill a the creature yours damages, if you can swing in with the team and activate the Spell Mastery effect you can creature a huge tempo swing in your favor. It’s not something I would consider playing at first, but if the synergy was there I’d play it as my 22nd or 23rd choice in limited. 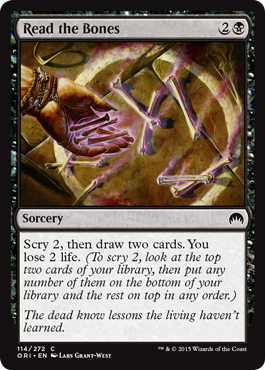 Read the Bones is always good in limited, IF you don’t mind losing 2 life. I like it a lot more than cards like Divination or Artificer’s Epiphany due to the added “scry 2”. It lets you toss away useless cards to the bottom and then gives you 2 cards. I wouldn’t play too many of these, but it’s not bad to have 1 or 2 in your 23. I just don’t know if I’d give up space for a creature or other piece of removal for it. I think it’s worth playing over a subpar creature, especially if you have strong cards you want to dig through quick. Depends on the deck you build. Valar Morghulis. All men, or in this case creatures, must die. Last, but certainly not least I’d like to recommend Nantuko Husk. 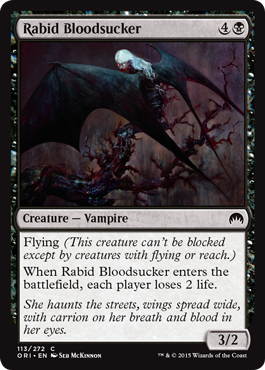 I’ve always liked creatures with this type of effect (such as Bloodthrone Vampire). In an aggressive deck It forces your opponent to make a choice between doubling up to block this card, or to let the damage through and risk losing a lot of life when the unfavorably blocked creatures are sacrificed. Black will supply him with a good amount of zombie tokens I think, but I’d also like this with blue or red and a handful of ways to make 1/1 Thopter tokens. Not a finisher, but it will help form a strong backbone for your black/x deck. Gnarlroot Trapper – best in a GB Elves deck, otherwise “meh”. Shambling Ghoul – 2/3 for 2 mana is good. It’s no Diregraf Ghoul, but it’s still good. Thornbow Archer – Also not bad in an aggressive deck, especially if it’s GB elves. Touch of Moonglove – neat combat trick that acts as removal of sorts if your pool doesn’t have much. Weight of the Underworld – Another good alternative to solid removal if your pool’s choices are limited. It will kill a decent number of creatures. Black feels like it’s balanced very well. When evaluating the cards, I kept finding myself thinking “that’s not bad, but it’s not great either”. There are fewer situational than in blue, and the rares are really good. It’s not a support color, but it’s not a main color either I think. Black is a partner color that can carry its weight and do a little bit of everything. I think it’s a solid color to choose in limited and that it only gets better when paired with the other cards. White is still my favorite, but black is a close 2nd right now. I’ll probably be able to put out Red before the weekend so be sure to check back tomorrow for an update. Let me know what you think about black and if there are cards that you would evaluate differently for other reasons. I hope to hear from you! I like the look of black. All four themes (GB Elves, RB sacrifice, WB Enchantments and UB creatures in the yard) look fun. Well WB not so much but the others definitely.